If God exists, then, why is there evil? 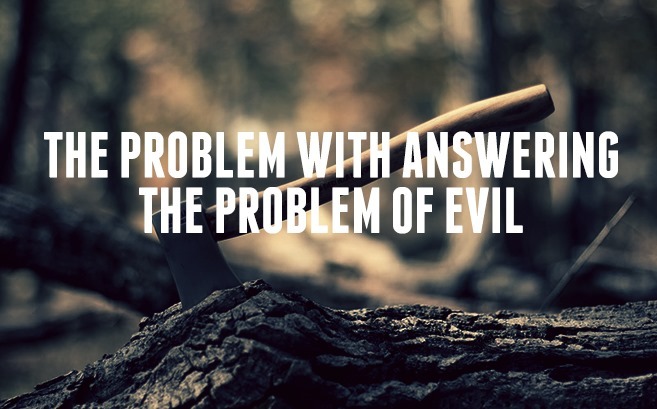 The answer is simple "Because people do evil." Yes, there are those things that we think of as evil, such as hurricanes and floods. But, they're really just naturally occurring events which are no more moral in nature than a rain that ruins the family picnic. Inconvenient? Yes. Tragic? Sometimes. But immoral? Hardly. Now, I understand the difference between an inconvenient rain and a flood that kills thousands or hurricane that destroys a city. As unfortunate as these events can be, they still have no moral basis. More importantly, they are not only natural events, they are necessary. Not the deaths or loss of personal property, mind you, those things are collateral damage. Only that without such events—as destructive as they can be—the world that we live in would be very different place, and not for the better. To the mind of a child, though, whatever they perceive to be good, is good. And, whatever isn't, is bad. Of course, what children think of as good and bad is mostly shaped by their likes; candy is good, for instance. Broccoli is bad. In reality, the opposite is true, no matter how deeply a child may believe otherwise. Similarly, we can't eliminate bad weather, unless we eliminate good weather. We might also have to do away with the sun that provides warmth and the ocean with it's great beauty and bounty, if we wish to stamp out sunburns and the possibility that a child might drown. The cool breeze on a summers day and the first snow could mean a tornado or an avalanche. So, they must go, as well. Plants and animals must be eradicated. That is, if we want to guard against the possibility that our beloved dog could be hit by a car. Or, that a house cat might feed on a cute mouse or lizard, leaving us with an over-abundance of both. In truth, the only way to eliminate suffering is to not live at all. This should be obvious, but generally isn't. The lone variable that we can always account for, is us. What we do. How we respond to circumstances beyond our control, that is within our purview. The rest we can guard against—and, wealthy, successful cultures have, with great success, managed to do exactly that. Inevitably, though, people living in such cultures begin to ask “Why us and not others less fortunate?” They ask this because they are the beneficiaries of ideas and laws put in place, sometimes, centuries before. They've been given a gift, that they now have come to see as the norm. And it may be, for them, at least. For just about everyone else living in the world, either now or throughout history, the exact opposite is true. What happens next appears to be counter-intuitive. Rather than sharing this great knowledge with those less fortunate, so they might also have a better, safer life, people systemically begin to undo the very things that kept the evil within, at bay. They do this by attempting to make the world over in a flat, characterless gray, where no one is better, or stronger, or smarter, or has more than anybody else. After all, it's better that everyone is poorer, than a few are richer. It is a world without risk, and as such, a world without reward. What does this have to do with God and evil? It isn't immoral when a shark eats an unfortunate person. It's simply what sharks occasionally do. Morality, then, is an exclusively human attribute, just as the capacity for great thoughts is ours alone, too. Not the monkey, not the zebra, not even the beloved dog share this trait with mankind. But, when you place humanity on par with the rest of creation, suggesting man is nothing more than an a animal, the outcome is unavoidable. We used to know that. Apparently, we no longer do, which is as good a definition of evil, as I can think of.